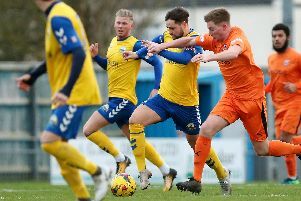 Craig McAllister called on Gosport Borough to find a way to win ugly after the 3-2 defeat at league-leaders Taunton Town in the Southern League premier division south. The player-manager was hugely disappointed to come away empty-handed after a decent performance. It was even more frustrating watching it from the sidelines because of a hamstring injury. He said: ‘I didn't think there was a lot between the two sides. ‘Once again though we paid the price for poor concentration. ‘After scoring a very early goal I was hoping that would drive us on. ‘We went desperately close to scoring a second goal before letting them in for two goals before half-time. ‘At half-time we talked about the importance of keeping tight to them and making sure we stayed in the game. ‘All the time we did that we had a chance of snatching something. ‘Then their lad scores an overhead kick with no one anywhere near him. Borough made the perfect start with Sam Lanahan looping his header over the home goalkeeper inside the first minute. Two minutes later another Lanahan lob was cleared off the goal line. Gradually the home side found their feet and forced an equaliser. Still Borough created chances and Matthew Weaire had a header well saved by the home goalkeeper. Before the break the hosts hit the crossbar and then took the lead in stoppage time with a pin-point free-kick. The game was up for Borough when they conceded the third goal. All they could manage after that was a Ryan Pennery free-kick goal in stoppage-time at the end of the game. 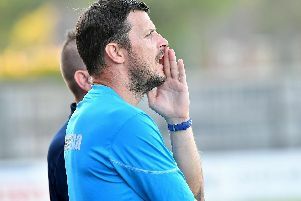 Boss McAllister said: ‘It isn’t through a lack of effort because again we have scored two goals away from home. ‘A draw would have been a fairer result. ‘Taunton played the percentage game getting the ball forward quickly and trying to force mistakes. ‘We have to learn to deal with that better. Borough remain in deep trouble one place and one point above the relegation zone.